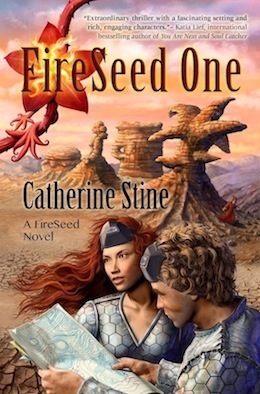 I am so excited to be part of Catherine Stine’s Blog Tour for her YA science fiction novel, Fireseed One! You can check out the other stops on the tour (including interviews, reviews and giveaways) and Catherine is giving away two ecopies of her book, but first… a bit about Fireseed One! What if only your worst enemy could help you save the world? Fireseed One opens onto a near-future earth of floating island farms, people zipping around in amphibious boats, and 18 year-old Varik hanging out with his dolphin, Juko by the water’s edge. In a hot minute, things turn treacherous, when a beautiful and shrewd terrorist named Marisa, breaks into Varik’s father’s secret underwater vault that stores the world’s food supply. Varik must take Marisa, who knows way, way too much about things that are none of her business, to scorching desert lands in search of a magical hybrid to try to save the food source. Problem is, the Fireseed plant Varik’s father envisioned may not have ever existed off the drawing board! Things get truly daunting, when Varik and Maria are captured by a cowled Fireseed cult who worships Varik’s drowned father. Will the cult chop up Varik, the founder’s son and eat him to gain magical Fireseed powers? Will Varik and Marisa ever get back to Ocean Dominion? Fans of Divergent and Feed will likely enjoy this thriller, as well as those who like a dash of romance with their page-turners. Fireseed One is available for $2.99 in ebook on Amazon, Barnes&Noble, iTunes, and Sony, and $7.99 for the Collectible Illustrated paperback. Catherine Stine’s YA futuristic thriller, Fireseed One launched in December, with original drawings by the author. Her first YA, Refugees, earned a New York Public Library Best Book and a featured review and interview in Booklist. Middle grade novels include The End of the Race in the Wild at Heart series and A Girl’s Best Friend in the Innerstar University series. More and more, she’s enjoying writing page-turning suspense. She is also a published illustrator. Stine does manuscript evaluations and teaches creative writing. She loves to travel with her sons and hubby, and also loves visitors to her blog and Fireseed One Facebook page, so come say hello! You can find Catherine on Goodreads, her blog or website, Facebook, or on Twitter. I asked Catherine if she would guest post on YA SF, a subject just a little close to my heart. Not only do I write it, but I fangirl over it (see my Beth Revis meltdown), and I love that we’re seeing more and more of it! paranormal abilities can be part of a plausible sci-fi narrative. from which they can’t, but must escape. referring to the old style “hard-sci-fi” involving tech gadgets and robots. Doesn’t that burn you up, ladies? We want our new YA sci-fi! sci-fi, such as Mary Pearson’s Adoration of Jenna Fox? Jenna wakes up from a coma and can’t remember who she is. ways that raise questions of identity and medical ethics. One is a sci-fi thriller, with a fire and ice romance. Catherine is giving away TWO ecopies of Fireseed One! Giveaway runs through Sunday, March 4th – winner announced Monday. Marketing gurus are idiots. Sci-Fi FTW! Its great to meet Catherine! Good luck with Fireseed One. I agree there can be other elements incorporated into sci fi if they are plausible. I think I accomplished that. This post is worthy of a Tweet. Yay, Stephan, and yes, Matthew, marketing "gurus" sometimes get it as wrong as weathermen. TOTALLY awesome post! I'm bookmarking this one to share with my students. Thanks Susan AND Catherine! I can't seem to open the rafflecopter, but I'd love to be entered for an ebook. Thanks, Shannon! A downloadable study guide is in the works for Fireseed One, as it touches on many topical subjects. I'd throw Tahereh Mafi's Shatter Me into that blend mix – sort of a dystopian YA Sci-fi paranormal romance. Luckily you can just call it YA. Bryan, good one, that gave me a chuckle. Put it in the blender and mix. Thanks, Catherine, for helping me understand the differences in these categories. I never was quite sure. I loved The Adoration of Jenna Fox and have the sequel to read when time permits. Like always, great write-up by Catherine. To be honest, like Beverly here, I also don't have much idea about these genres, confuse me a lot. Thanks for the article. Oh wow, all I could think for the rest of the post was, "I hope they don't chop up poor Varik!!!" So yeah, my interest is certainly piqued. I think every time I look there's a new trend of something that someone is looking for. I don't see how anyone can keep up with that. And someone is always saying "vamps" or something else is out. And then someone immediately gets a huge book deal with seven figures for writing said "out" material. Great insight to the YA SciFi and Fantasy market. Thanks for sharing it with us. Huge Congrats on your book getting published. Yes, Michael, I'm sure a totally fresh, inventive vamp would still get snapped up! And, yes, Angela, Varik IS in danger of being "consumed" by the cult… (at least in some fashion). Cecelia, I'm glad I could update your concept of sci-fi. That techie five–page rocket rant/hard sci-fi is old-school. Thankfully many recent authors have blown that crusty, outdated sub out of the water. There are also many well-respected women authors who helped push sci-fi out of the "hard" style and into the more personal/psychological/ inventive, "soft sci-fi" genre, such as Nancy Kress, Octavia Butler, Connie Willis, and the younger, quirkier Kelly Link, who blends genres as well-horror, fantasy, sci-fi. I'm glad to hear that the idea of "science fantasy" is catching on, since that's the genre I publish in! Thanks for your insight – great post. That's great that sci fi is up and coming. I'll read anything with a great story and great writing. Best of luck to Catherine. Catherine – thanks for stopping my blog earlier, and good to see you here on Susan's wonderful blog. I loved reading your take on YA SF. I just recently complied a survey of YA SF to see what all was out there. Came up with over 170 books (not including sequels!) and just added Fireseed One to the list. I used slightly different categories than yours to group my list, and broke dystopia into several different subcategories. But I wasn't sure which of my categories to put yours in – maybe I need to revamp my categories? Also found it interesting you include magic in a SF book. There's a few other SF/fantasy-with-magic hybrids out there – a fascinating mix! Margo, check out my comment on your survey post. First of all… AMAZING!!!!! I love science fiction 🙂 I recently read the YA novel 'Cinder' which I guess is sci-fi romance, and loved it. I think that's sci-fi, anyway. It's so hard to put things in a genre because everything blurs into everything else! Margo, thanks so much for including Fireseed One on your list! As far as trying to categorize it… um, sci-fi thriller. And Miriam, sci-fi romance is a cool blend. In the adult market, it is already a thriving category. Fireseed One sounds wildly original and exciting. I love reading and writing Sci Fi. I'm jazzed that it's getting attention. Thanks, everyone, who made my guest post buzz with great comments, and a big shout out to Susan for hosting me. Thanks, Susan! Yes! Finally something about christian loouboutin on sale. Hurrah, that's what I was looking for, what a data! existing here at this website, thanks admin of this web site.